There’s nothing like getting ready to go cool off in your very pleasant and satisfying blue lagoon pool, only to find that some form of sabotage must have taken place because your beautiful lagoon has turned into an algae infested pond. Now you have green pool water. It seems like especially here in Florida this is an all too common occurrence. But how is it happening? You have added all the proper chlorine and brushed the pool every week, but still, you have algae like the pool has been neglected for years. To learn how to clean your own pool, follow our step-by-step guide, or call us and set up service! Sounds like a perfect storm in Florida and you can see why it can be so simple for your pool to turn green. In fact, it only takes a few hours of an improperly chemically balanced pool to start building great amounts of algae. Green Algae mutates like a virus and has over 8,000 variations. Some of these variations have been known to be resistant to levels of chlorine up to 20ppm. There are many techniques that can be used to clean a green pool, and depending on the severity you may be able to skip step one. If the pool water is simply green, it may not need to be “waste vac” vacuumed and skimmed however if your pool has a mucous build up of algae like the following picture it is advised not to skip step one. Step 1) Use your skimmer net and pole to skim out as much algae off the service of the water. Then hook up your vacuum and your vacuum hose to your telescopic pole. Now vacuum up as much algae as possible through a WASTE VAC LINE, (this is a simple T valve inserted into the output side of your motor in the PVC. If your pool does not have this waste vac line check out our other post on installing waste Vac line). Your waste vac line will empty the pool water along with the Algae, be sure to hookup your backwash hose line and direct the waste water where it is safe and legal. Remember it’s never wise to dump algae water on your neighbor’s property. Ridding your pool of all this excess algae will prevent it from getting into all of your equipment and building up in your motor and filter. NOTE* Waste vacuuming your pool will lower the water levels. You don’t want to lower the water much more then a few inches so only vacuum fewer then 10 min. Step 2) Brush down your pool. All of the walls and the floor. Brush several times as your visibility may be limited so brushing several times will help you hit all areas. Algae has a mucous sheet that needs to be broken through to help the chemicals kill it faster. Step 3) Test your waters pH levels. Ph is higher in a algae pool. Step 4) Add appropriate chemicals, use acid as recommended to lower PH. (be cautious of fumes). Add granular, liquid or a mixture of both to shock the pool. Recommended 1 pound of granular for 10,000 gallons. And 2.5 gallons of liquid for 10,000 gallons of water. 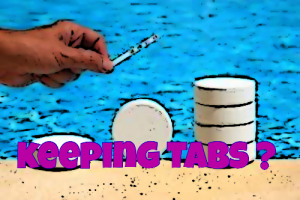 Depending on the green pool, dosages may need to be increased. Step 5) Be sure to clean your filter. If its cartridge which is most common, hose off your cartridge filter. If sand or DE backwash. Step 6) Let your motor cycle continuously for 24 hours ( note this will increase electricity used). Step 7) Check on pool and repeat process if needed. 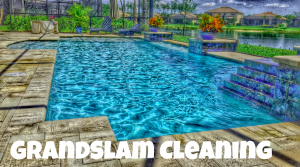 As always if you ever need help or assistance in the Cape Coral, Fort Myers or surrounding areas of Lee County don’t hesitate to give GrandSlam Cleaning & Maintenance a call. Mention this post to receive 10% off.